Mountain Brook’s village streetscape project grew out of an appeal by local merchants for city improvements to remain competitive with growing suburban shopping centers. In 1995, the City hired Nimrod Long and Associates to design streetscape improvements for the three historic retail villages; the villages were part of the city’s original 1920’s master plan. Each village had evolved their own unique character through distinctive architecture, scale, and shops. The goal of the project was to enhance these existing qualities with improved sidewalks, attractive lighting, better parking, and proposals for appropriate infill development to strengthen the villages’ character. Each village has a featured area that acts as a village center for surrounding neighborhoods. 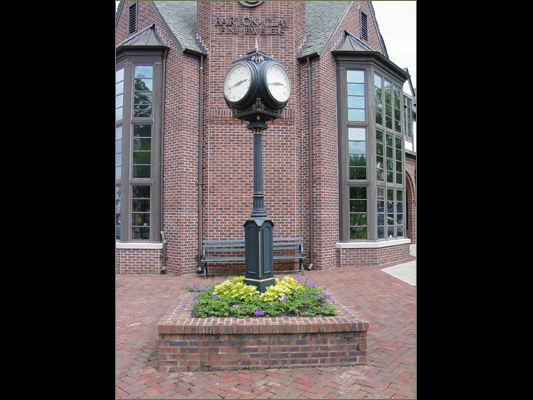 In Mountain Brook village, traffic islands were enlarged, planted with interesting, hardy plants and a distinct clock was installed. New brick sidewalks and lighting around this grand central space created an inviting pedestrian experience.